US-Canadian author, blogger and international human right activist Robert Fantina writes about American imperialism, and United States’ foreign policy which is basically written by the pro-Israel lawmakers to please their Jew masters. He is author of Empire, Racism and Genocide: A History of US Foreign Policy, and several other books. He resides near Toronto. A pro-Israel regime change in Syria has been an Israeli Project since the day one. In a recent article, entitled, Trump Attacks Syria to Please Israel, Fantina agrees with Minister Louis Farrakhan that in November 2016, the American voters had no other choice but to elect one of the two Biblical Satans. 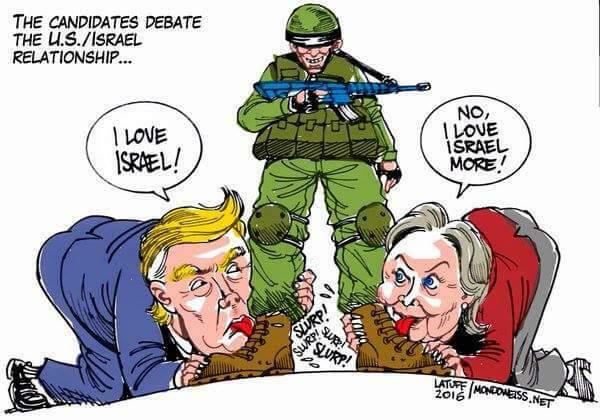 “In the 2016 presidential election, among the two prominent political parties, the hapless United States voter had to choose between a Zionist war-monger and a Zionist war-monger. Deciding that Democrat Hillary Clinton had far too much baggage to take back to the White House, the voters decided, through the bizarre institution known as the Electoral College, to install as president a reality-show television star and business tycoon, the thrice-wed blowhard, Donald Trump,” Fantina said. “The role of the media in all this can’t be excused. When Israel uses chemical weapons against Palestinians, there are no pictures of the victims on CNN, MSNBC or in The New York Times. When Palestinian children playing on a beach are shot and killed by IDF soldiers, no one in the media proclaims ‘We are all Palestinians’. When a young Palestinian, lying wounded on the ground, motionless, is shot in the head by an IDF soldier, and that soldier is sentenced to an 18-month prison term, no one compares that with the 15-year prison term Palestinian youths receive for throwing rocks. Fortunately, social media and the alternative press provide facts on the ground,” Fantina said. White House senior National Security adviser Lt. Gen. McMaster, a pro-Israel Christian Zionist, wants Donald Trump to put 150,000 US boots in Syria in order to make Syria an Israeli colony.